Splashed all over the news, you cannot travel with anything that, well, splashes. Airport security is tighter than we’ve seen since 2001 and unfortunately it’s not a Hollywood publicity stunt to sell tickets to Oliver Stone’s World Trade Center. SheFinds doesn’t want your CrÃ¨me de la Mer to get confiscated so make sure that you follow the rules and leave lots of extra time when traveling during this heavy volume vacay time. Q: What can’t I pack in my carry-on bag? A: The new rules ban almost all liquids, creams and gels from being carried aboard flights. 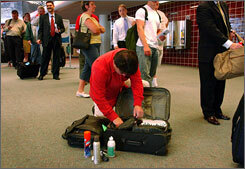 That means you should not pack sunscreen, lotion, shampoo, toothpaste, hair gel or beverages in a carry-on. If you are in doubt about an item, pack it in a checked bag or leave it home. Get more answers to your questions at usatoday.com and get airport status and updates at faa.gov. So you can’t carry-on your face spritzer or any extra hydration (including bottled water). But you can travel in comfort. Check out our past posts to travel in style.